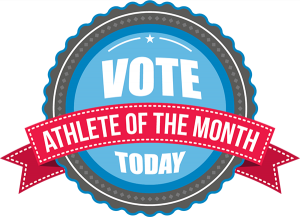 DAPHNE, Ala. – The United States Sports Academy has announced its Athlete of the Month ballot for March and public voting is in progress. Following the selection committee’s meeting, 12 candidates – six male and six female – from five countries comprise the list. Everyone is encouraged to cast a vote on the Academy’s website at www.ussa.edu and have friends do the same. The full ballot is listed along with bios of what each athlete accomplished during the month. Voting will continue until 5 p.m. Central time on Thursday, 13 April 2017. Male nominees are Sidney Crosby, hockey, Canada; Marcel Hirscher, skiing, Austria; Stefan Kraft, ski jumping, Austria; Marcus Stroman, baseball, United States; Sindarius Thornwell, basketball, United States; and Russell Westbrook, basketball, United States. Female nominees are Gwen Berry, track and field, United States; Evgenia Medvedeva, figure skating, Russia; Laura Muir, running, Great Britain; Mikaela Shiffrin, skiing, United States; Elena Vesnina, tennis, Russia; and Morgan William, basketball, United States.